Hey, are you looking for some easy recipes that just take just 10 minutes to hit the plate? Yogurt, got this name from the Turkish word “yogurur”, which means “long life”. There has long been a belief that eating yogurt is associated with longevity, and many studies have been done. Chocolate has properties that combat Heart disease-tanks to flavanoids from the cocoa plant. Repeated studies have shown that chocolate does not cause acne - or make it worse. The phenyethylene and anandamide contained in chocolate have anti-depressant properties. Chocolate is mildly addictive, but a bar now and again is not going to hurt. With all those great antioxidants it contains, it may even help you live longer. After all, as the saying goes, "A little of what you fancy does you good". It is widely believed that chocolate consumption releases a chemical into your body very similar to what is produced when you are in love. 1. Take non-flavored yogurt/ fresh curd in a bowl. 2. Add sugar to it and stir well. 3. Now add 2 tbs of Chocolate Sauce to it and mix well. 4. Ornament with chocolate curls/ chocolate sauce. 1. If you are using fresh curd, please strain out excess water to give a creamy texture. You could do that either with the help of a soft cloth or an easier option would be to tilt the bowl and let the excess water flow out. Make sure the curd doesn't run out; use a spoon to hold it back. 2. Use refrigerated curd/yogurt for better taste. What a quick n easy recipe-i bet that is super yummy as well!! 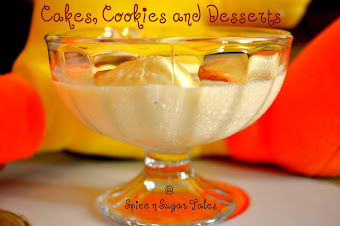 Guilt free dessert..looks divine..first time to your blog and glad to follow you..
My kind of quick and tasty drink..